Ludicrously cookie picky. – Wait…are those…cookies?! I just realized I have never posted a cookie recipe on this blog! This blog, in whose title COOKIES plays an extremely large part. Mind blown. This is on the scale of severe cookie deprivation. Cookies are… my favorite things. EVER. But I’m really particular. No, let me rephrase that. Ludicrously picky. Just ask anyone who has ever come with me to buy one in a bakery or somesuch. I’m that kid. The one who points to a cookie waaaay back in the back under about five other cookies and will not walk away until that specific cookie is in my possession. Yep. That kid. And chocolate chip is my ultimate favorite. Except only the ones that are chewy/slightly crunchy on the edges, and chewy/soft in the middle. See? I’m not picky, or anything… To date, the best chocolate chip cookie I’ve eaten is from a bakery at home—I get one every time I fly up to Oregon, and have been known to buy one a day in advance, if I’m flying out too early to get one the day of. Whatever, at least I have my priorities straight! But the funny part is… I am fundamentally unsatisfied with the chocolate chip cookies that I make. Weird, I know. But I way prefer to get them from a bakery (a good one, mind you…no cookie schlock for me). However. This does SO not apply to other cookies I make… these, for instance. I LOOOOVE pumpkin, as we know. 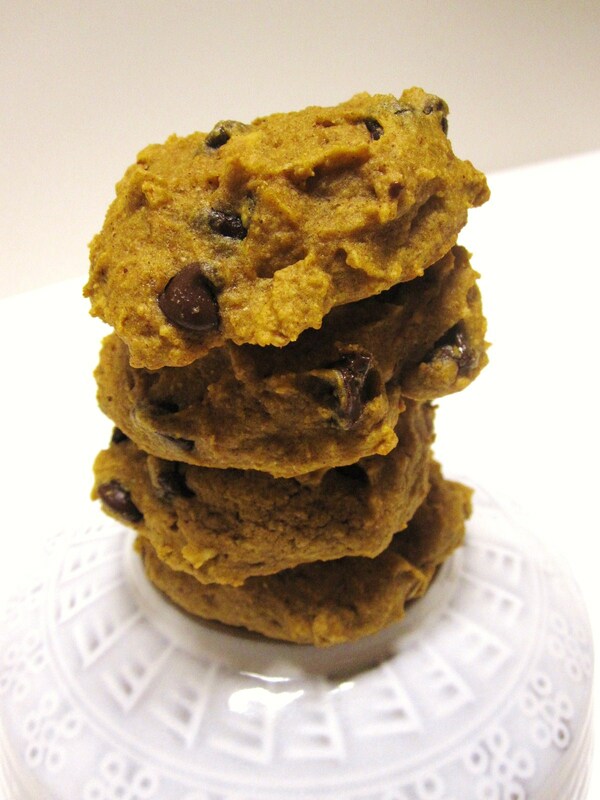 So it goes without saying that I LOOOOVE pumpkin chocolate chip cookies even more. Besides, opening a can of pumpkin but not using it all gives me an excuse to eat my favorite pumpkin-y breakfasts. And having cookies around makes my days sooo much better. 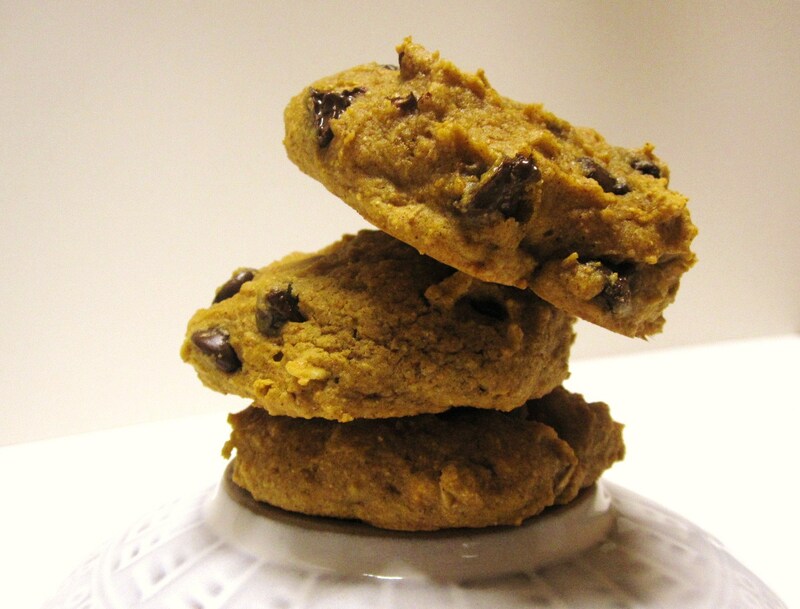 These cookies are my favorite kind of pumpkin cookies: cakey and soft. I know there is some debate in the cookie camp over whether a cakey cookie is acceptable, and I would certainly agree that cakey cookies are WORTHLESS when I want a good chocolate chip (refer to above statement regarding acceptable cookies). However. 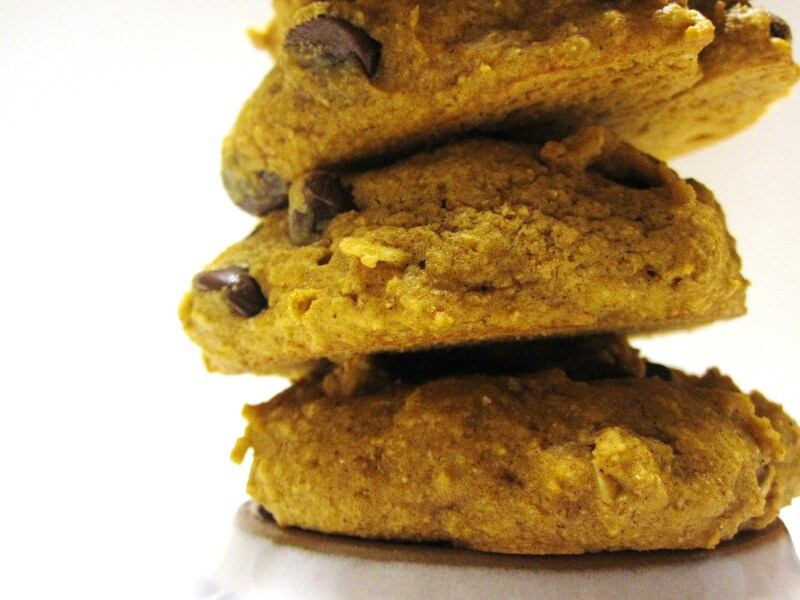 Pumpkin cookies are designed for cakey factor. Pumpkin somehow makes cakey acceptable. I enjoy these based on their cakeyness. However. If you try to trick me with a cakey chocolate chip cookie, I don’t think we can be friends. So. Without further ado, here are the cookiesss! I made half the recipe, as per usual, which gave me 11 good-sized cookies (good sized, as in you don’t feel cheated with one, or guilty with two. Not you should ever feel guilty about eating cookies, I mean really. They’re COOKIES!) I’ll post the halved recipe here. Preheat the oven to 325. Grease (hoooray, coconut oil!) your cookie sheet. These cookies don’t spread, so I was able to get the whole bunch on one cookie sheet. Also why I love half recipes—it’s as close to instant gratification as I can get when making my own cookies! In a mediumish bowl, whisk dry ingredients together (flour, salt, soda (If you remember it, ha), powder, cinnamon, ginger, and nutmeg). Toss in oats and stir to combine. In a largeish bowl, beat egg and sugar with an electric mixer until light colored and foamy. This doesn’t take very long, hooray! Add in oil, pumpkin, and vanilla, with the mixer on a lower speed. Add in flour, attempting to NOT spray it all over your kitchen (NO, I did not do this…this time, anyway. It’s definitely been known to happen). Fold in choc chippies once the flour is all incorporated. 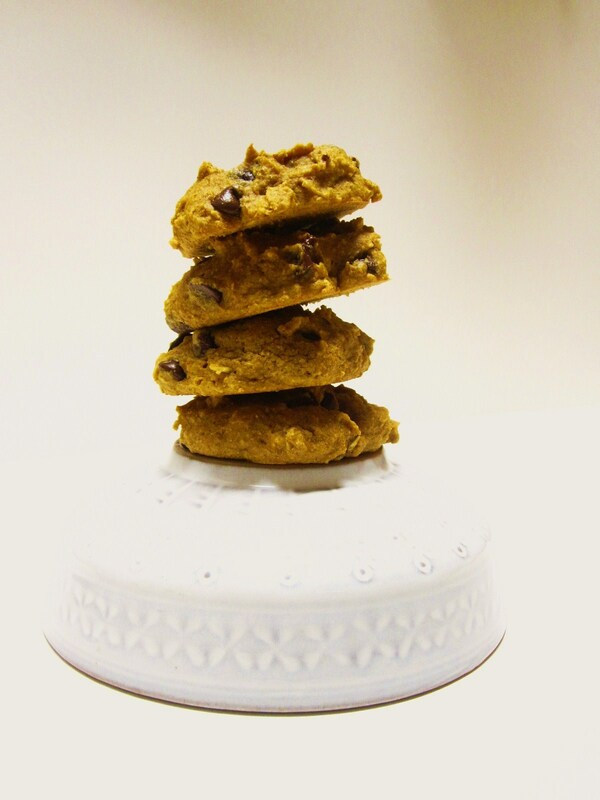 Bake until the cookies feel firm to the touch on top, and a tester comes out clean. Mine were done at exactly 16 minutes, and I left them on the cookie sheet for a bit before taking them off. A metal spatula works best for getting them to the cooling rack. Open the gates for more cookie recipes! Next PostNext Umpteen zillion ripe pears, and what to do about it.